The Our Faiths and Our Shared Futures Booklet is an extension of the work that was initially conducted in the Midlands (Derby) and which was also carried out in the London Boroughs of Haringey, Enfield and Barnet. 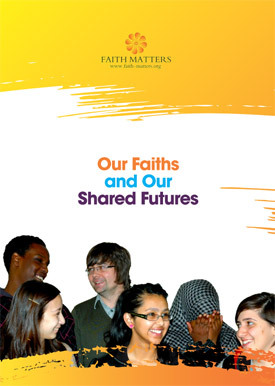 The ‘Our Faiths and Our Shared Futures’ booklet involved discussions on scriptural texts by religious leaders in the boroughs and with young people inputting into the content and the design of the booklet. All of the work involved local people and local organisations and fits under both the Big Society and Preventing Extremism agendas. Discussions on (i) respect for diversity (ii) the protection of life and (iii) countering extremism have been included within the local contexts of the three London Boroughs. We hope that this booklet makes a useful addition to the learning materials for your work around communities learning to live side by side and working for the common good in areas. Please note: this is a large file and may not open straight away on slow connections.